I have been designing a planting plan for a small garden, about 9m across by 11m deep, overlooked by other houses as are many new gardens nowadays. The problem is that to provide a screen one must also cut down on sunlight a little, as the garden faces southwest. I have included a tree on the left-hand side nevertheless, to distract attention from the distant house and provide seasonal interest. An amelanchier lamarckii or snowy mespilus is a lovely small tree with spring blossom, berries in the summer and vivid autumn colour. The south-west sun is not so much of a problem on the right hand side, so here I have suggested a slightly bigger tree, a sorbus or a crab apple, to screen the garden from the nearest house. Sorbus ‘Sunshine’ is one of several sorbus or rowan trees you could use. Again it has several seasons of interest with flat umbels of tiny white flowers in spring, delicate green compound leaves like those of an ash only smaller, and deep yellow/orange berries in autumn. The other tree that I recommended, which was eventually rejected because the fruit dropping was messy over winter, was Malus ‘Evereste’. 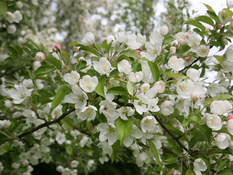 It has white spring blossom from reddish buds, then in autumn and over winter there are orange-yellow fruits to look at. It is a conical-shaped tree, so perhaps it was not suitable anyway for this spot, as I wanted something that would broaden into a vase shape to block out the house, not point upwards towards it. Yet another tree you could have in this spot is Cotoneaster cornubia. This is semi-evergreen and does eventually get quite big, however it spreads to a good shape and has red berries over the winter, just like its cousins in shrub form. Now it’s spring and time to enjoy the blossom of all our spring deciduous trees. Perhaps have a look at what is out in the garden centre and make notes for your own plot. Trees have so much to offer and really make a garden into a haven for you and for wildlife. Have fun choosing one. Hi Jane, great read, I’ve been a bit obsessed with small gardens recently so I was really pleased to stumble on your post. I think that putting trees in a small garden is a great idea, I believe large features in smaller spaces create the illusion the garden is bigger than it actually is. A line of small trees with a bench an archway with a bench underneath is a great feature in a small garden. An archway like this one http://www.harrodhorticultural.com/ogee-half-lattice-superior-garden-arch-pid9043.html would be a perfect frame for a nice bench with a line of small trees bordering a little walkway. Thanks for the comment, Peter. That’s a lovely arch – expensive, but Harrod are a well-known firm so I imagine it would last well. Mind you, the garden I was designing, and today’s gardens in new estates, don’t have room for a whole row of trees unless you don’t have anything else in the garden! But a nice idea. Previous post: What plants do you need for your space?